Dirty dynamometers cost the Tank Command over $100,000 annually in repairs. They use brake horsepower dynos to test tank engines. Water from a cement-lined reservior cools the brake dyno. The pH of the water was acidic (4.6 s.u.) and was dissolving the cement liner, carrying calcium and lime into the dyno cooling loop, scaling the pipe wall, and attacking the circulation pump. The Tank Command had allocated $1,750,000 to replace 4,000 feet of pipe. DiHydro assessed that the pipe could be saved. The project took 8 days and $72,000. Marymont Apartments - An 830 unit apartment building in Laurel, MD, reported 174 pinhole leaks in the copper domestic hot water piping from February 2, 2005 to February 2, 2007. DiHydro analyzed the type and cause of the pinhole corrosion leaks. Than instituted an engineered treatment program in June, 2007. Marymont has reported only 2 pinhole leaks. Over the next 3 years Marymont will save over $70,300 per year (for a total of $210,900). Apartment building planned to re-pipe the entire buildng. 1212 South Michigan is a 30 floor, 33 year old apartment building with 330 apartments. When DiHydro became involved, 1212's owners had taken bids to completely re-pipe the building. DiHydro analyzed the piping system, located and isolated each problem cause, revised the re-piping to replace only identified problem sections of pipe saving the building $1,240,000 all without moving a single tenant. The 250,000 square feet of UMHBC was experiencing piping leaks, brown water, poor or reduced flow in their galvanized domestic hot water and therapeutic water systems. DiHydro analyzed the system, developed a program that consisted of strategic pipe and valve replacement combined with some pipe cleaning and corrosion control treatment to stop red water and arrest existing corrosion for a cost of $491,959. Country Corners Apartment Complex, Washington D.C. Drinking water piping in the complex estimated replacment cost of $1,023,000. Country Corners was in the process of selling the complex for condo conversions when the sale was put on hold because water testing results indicated high lead levels in the drinking water distribution piping. Before sale, the lead in the drinking water had to be brought below a level of 15 parts per billion. DiHydro analyzed every apartment's fixtures (system) that actually had high lead levels. Brewing company saves $609,375 on water bill. City water department settles with brewing company, which eneded a long dispute over unpaid sewer and water bills with an agreement investigated and brokered by DiHydro, where the brewing company paid 35% ($328,125) of the originally agreed water billing statement of $937,500. The city claimed the brewing copmany owed $937,500 in water and sewer billing; the brewing company believed it owed $270,000. The dispute stemmed from 2.36 million dollars in unpaid bills that the water authority had agreed to reduce in 2007 if the brewing company had agreed to continue to maintain offices and to brew beer in the city until 2011. The goal was to keep the 80 jobs in the city and to encourge the brewer to upgrade the equipment. The brewing company closed the plant in mid 2009, which violated the initial settlement agreement. To help settle with the city, the brewer agreed to tear down the building site and to provide alternative site developement and/or plan for the property. The 27+ year old building in the Northville Psychiatric Center complex was experiencing leaks in a 2,200 foot section of 1½" galvanized pipe. The 126 lab sinks, showers and tub fixtures connected to this section of pipe were completely blocked with rust. Replacement cost for the 2,200 ft. section of pipe was estimated at $55,000, until it was discovered that the pipe in question was insulated with asbestos. Replacing the pipe meant removing the asbestos as well as disposing of it. Replacement costs increased from $55,000 to $165,000. 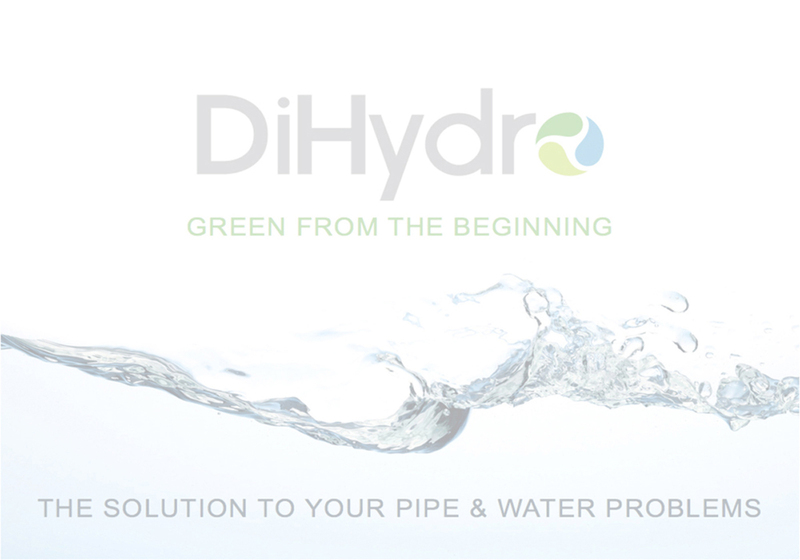 DiHydro sealed the leaks in the 2,200 ft. section of pipe and restored flow to all 126 fixtures within five days without disturbing the asbestos pipe insulation, for a total of $11,000 - saving $153,900. All of this was done over a five month period, without displacing tenants, tearing out walls and only repiping five apartments. The total cost for the restoration program was approximately $425,000. This included 17 new water heaters, partial repiping of the hot water lines in 11 buildings, 12 return pumps, plus a dozen new shutoff valves. The savings of $2,925,000 was accomplished with little tenant disruption.